Choosing the best plants for Phoenix weather must consider several factors. The year round sunshine and dry climate affects what foliage can thrive. Your time to water, fertilize and maintain flowering plants or perennials should be kept in mind. A garden is a mini-ecosystem and planting invasive species can crowd out native plants, while introducing pests, such as beetles or aphids. Of course, buying new plants should match your budget, which includes installation and follow up care. With this in mind, here are 3 top picks for desert friendly plants in Phoenix. Each choice is fairly inexpensive, easy to install and excels in our arid climate. 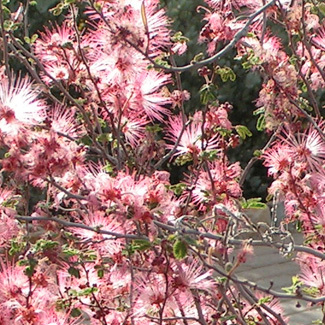 As a perennial desert plant, Fairy Duster provides year round color and only needs to be planted once. This colorful species is readily available at your local Phoenix nursery and is affordable. The bush grows to about three feet in height and produces stunning flower balls in a bright red shade. Minimal water requirements mean this hardy plant can withstand drought and stores water effectively. Since this is a native species that thrives in the Phoenix desert; busy families can enjoy these exquisite colors with minimal pruning and upkeep. How you want the bush to be shaped will also affect how much trimming is needed. Yellow flowers from this perennial plant are nice complements to the earthy tones of desert landscapes. The red and orange centers of these flowers have an allure that draws people to your landscaping design. While this rugged plant is native to the desert; it is important to check soil drainage before planting this species. Why? Drainage minimizes nutrient loss from water runoff, which can prevent the trademark flowers from fully blooming. Phoenix does have chilly winter nights, so you should trim a Red Bird of Paradise in late November or early December to reduce the risk of frost damage. Note: The pods and seeds of this plant can be poisonous, Please ensure children and pets do not put this plant in their mouths. Otherwise known as Verbenaceae, this is an evergreen shrub that grows quickly and produces a spectrum of colors. Orange, pink and yellow varieties allow you to customize the garden design effects. With minimal care, this plant produces flowers through the seasons for fresh blooms that energize yard spaces. Be sure to buy just a few Lantanas, as the plant undergoes rapid growth and can overrun your garden. As a general rule, one or two of these exterior plants is sufficient for typical homes. A professional at The Green Goddess Plant Nursery in Phoenix is happy to suggest the right species of plants for your garden. This is an evergreen plant with long stalks that produce visually striking plumes. Known as an ornamental grass, this perennial plant can endure full desert sun and grow in various soil conditions. A quarterly trimming is all that is needed to keep the desired shape. As a taller shrub, consider Pampas Grass for corner spaces or to form the outline around a spa or other yard features. Each climate has native plant species that are well suited for the conditions. With proper planning, you can have wonderful colors and plants in the Phoenix desert. Please contact us or stop by our Phoenix garden center for more helpful tips.